A national seminar on the prospects of building a national strategy of sustainable learning and open educational resources was held in Birzeit University on April 20, 2017. 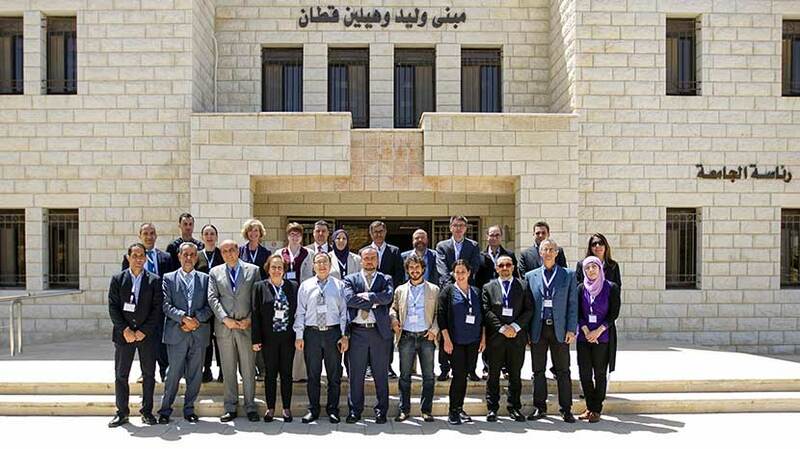 The seminar, "Palestine OER Strategy Forum", was organized by the Center of Continuing Education at Birzeit University in cooperation with a number of local and international organizations. The seminar, part of the Erasmus+ funded project "OpenMid", aims at gathering educators and managers from higher education institutions in Palestine to discuss and analyze the challenged and priorities for opening higher education in Palestine. The Vice President of Community Affairs at Birzeit University Asim Khalil talked about the challenges that face Palestinian universities today within the globalized and open communities, especially that they face outrageous acts that hinder its development. He assured that education must find strategic actions to implement open education practices and resources for the sake of the university's academic development. Birzeit University has so far, according to Khalil, taken the leap in this field in adherence with the global development in academia. The Director of the Erasmus+ Office in Palestine Nedal Jayousi talked about the office's mission to create opportunities for Palestinians to empower themselves with training workshops and exchange opportunities and be able to overcome the obstacles that the Israeli Occupation puts to hinder the process of academic development in Palestine. Jayousi emphasized on the need of enhancing cooperation and partnerships with peer institutions to reduce the gap between the usages of traditional means of education in adherence with the development of modern techniques in academia. Cristina Stefanelli, representing UNIMED, that this forum offers the opportunity for educators to know more about the activities and first results of the OpenMED project, and to debate Open Education initiatives and strategies in an Euro-Mediterranean context. The Director of the Center of Continuing Education Marwan Tarazi pointed out that living under occupation reduces the possibilities of developing education especially that many international academic experts and scholars are denied access to Palestine y the occupation. He added that the occupation controls the economic and industrial sectors in Palestine, which affects the employability rates within the youth.